18 February 2015, at 11:52p.m. UK - Strong production and weak demand are conspiring to push pig prices down in the UK and the EU generally, according to a market expert speaking at the Outlook Conference in London last week, reports Jackie Linden. According to Stephen Howarth [pictured above], the root cause of the problem is that supply has been running ahead of demand in both the United Kingdom and the European Union over the last year. Mr Howarth is Market Specialist Manager for the pig sector with BPEX. Speaking at the the Agriculture and Horticulture Development Board (AHDB) Outlook Conference in London last week, he predicted that UK pig meat supply will remain strong in the year ahead, adding that demand will need to pick up for producer prices to become firmer. The global market, meanwhile, is likely to become even more competitive this year as more US and Canadian pork becomes available, he said, adding that factors that could affect these forecasts are disease, retailer commitment to local production, feed price fluctuation and exchange rate movements. Long-term downward movements in pig prices have characterised the UK pig price over the last 12 to 18 months, said Mr Howarth, and the EU has experienced even more extreme reductions. Cull sow prices have also been falling steadily over this period and are not at their lowest since 2007. "A cull sow now has the same value as a cull ewe and that is a rare situation," he said. Weaner prices took longer to respond but they too have been falling since summer 2014. Mr Howarth remarked that even pork retail prices have fallen since the middle of last year and stood at around £4.80 per kilo at the end of 2014 compared with £5.20 a year previously. 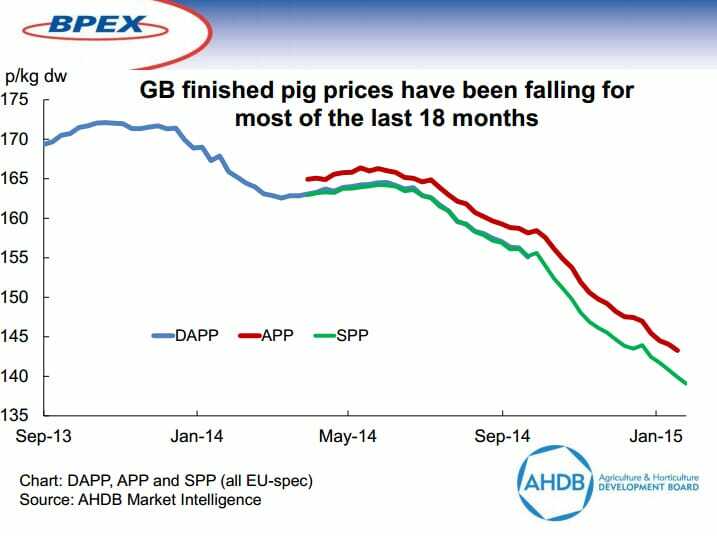 Pig prices in the EU have fallen even further than GB prices, he showed, from a peak of over €1.70 per 100kg deadweight in mid-2014 to less than €1.30 by December 2014. Because of the weakening Euro, the decline has been ever steeper in UK£ sterling terms. This means that the gap between UK and EU prices has been sustained at an all-time high, he remarked. Seeking to pass on some good news, Mr Howarth said that, although there was a recovery at the end of 2014, feed prices have fallen globally for around two years, thanks to two consecutive good global harvests. Overall, he pointed out, pig prices and feed ingredient costs have fallen between 10 and 20 per cent in the last year. Too much supply and not enough demand are the root causes of the falling pig prices, according to Mr Howarth. UK pigs have been in plentiful supply since the spring of 2014 - above those of the year before and at their highest since before the Foot and Mouth Disease crisis in 2001, he said. Carcass weights have also been on an upward trend with the monthly averages more than one kilo over the previous year since 2012, reaching a peak of over 84kg in November last year. 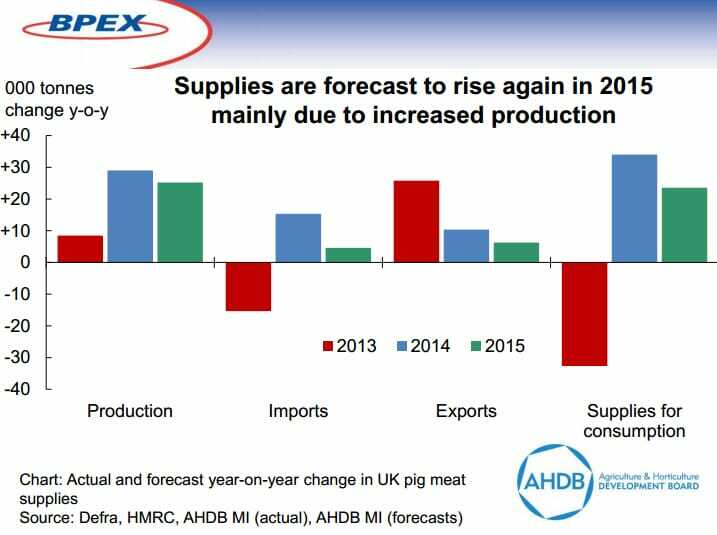 As a result, UK pig meat production was higher each month in 2014 than in the year before. The pig price gap has had only a small effect on imports, which were up just one or two per cent last year - while export growth has slowed owing to the relatively strong UK pound, said Mr Howarth. He remarked that UK retailers seem to continue to be sourcing the majority of their pork from the UK but overall purchases did not pick up last year - not for pork nor other meats, he said. EU slaughtering, meanwhile, also trended upwards last year, particularly during the last six months, while exports were hit by the Russian ban, from which the market has only recently started to recover. Comparing production costs and pig prices across Europe, Mr Howarth said UK margins are better than most. Production costs remained below prices for 18 months in the UK and although they are now approaching break-even, per-kilo prices are well below cost of production in almost all other EU countries. This difficult financial situation is leading to an increase in sow slaughterings in a number of countries, according to Mr Howarth, not least in Germany. With the exception of the Russian ban, which is likely to continue, Mr Howarth sees the global situation returning to normal in 2015. Global export prices, which broke records in the middle of last year, are already showing signs of cooling down. One factor is porcine epidemic diarrhoea (PED) in the US, he said. With new outbreaks around 100 per week this year compared to more than three times that rate 12 months ago, US production is likely to rise by five to six per cent as farmers there took advantage of the period of higher prices to expand and invest. Pork volumes in Brazil and Russia are forecast to increase by about the same percentage. Mr Howarth warned that, even if Russia were to lift its import ban soon, its requirements would be lower than before because of the increase in domestic production. Brazil, Chile and Serbia now supply most of pork to Russia, where the price, at around RUB200 per kilo, is almost twice that of a year ago. The Russian ban on pork from the EU, US, Canada and other countries does mean a lot of pork needs to find a new home on the global market, Mr Howarth pointed out. China is likely to be the number 1 growth market for exporters this year but Brazil and Chile are expected to be able to take better advantage of this opportunity than the EU. In the current challenging global environment, Mr Howarth expects a continuation of these current trends into 2015. For the breeding herd, he said, the fall in the number of sows recorded in June 2014 was an aberration and the national herd is likely to remain stable this year. Driven by improvements in genetics and management, productivity is likely to remain on its current upward path and this could lead to a two- to three per cent increase in slaughterings in 2015 and 2016. While they are unlikely to fall, the increase in carcass weights is likely to slow down so production will mirror slaughter numbers. As Mr Howarth explained, 2013 was a year of tight supplies and high prices. With higher supplies, prices were lower last year, while increased production is likely to push supplies up and prices down further in 2015. Looking to general economic indicators, earnings growth is forecast to be above inflation for the first time since 2009 but Mr Howarth wondered when this will impact meat consumption generally and pork in particular. Concluding his presentation, he identified exchange rate movements, feed prices, disease threats (particularly PED and African swine fever) and supermarket commitment to local meat sourcing as significant risks that could affect his forecasts.